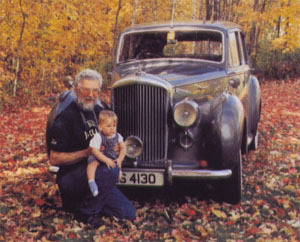 Bill Sander with 1954 Bentley and grandson. Bill owns a number of cars (too many to list here!) including a 1927 Model T Ford, a 1959 Corvette, a 1946 Ford pickup, a 1946 Dodge pickup, a 1947 and 1949 Plymouth. He’s shown here with his 1954 Bentley R Type Sedan holding his grandson. Bill and his wife Jan have hosted several meets in and about Jeffersonville including meets at their extensive garage complex and grounds.